Our expertise comprehends the physical component (endurance, force and speed) of training. Feel free to contact us if you want information in your own language. As a master in physical education, trainer A cycling and trainer A kayak, I started coaching in 1987. 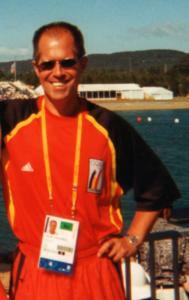 From 1993 to 2000 I was the headcoach of the Belgian National Kayak Team. I coached 28 world cups, 5 world championships and 2 Olympic Games. In that same period I was a member of the college of coaches inside the Olympic Organization. In 2002 I founded SPORTIM, giving athletes and clubs the opportunity to evaluate and improve their strenghts and weaknesses. For more than two decades I trained young athletes in the Cycling School of Ostend. Acting under order of VTS I wrote 2 manuals: "Methods for conditional training" and "The human body in motion - a physiological approach." In 2012 I published "Trainen op Vermogen", a book about training with a power meter. Success. Coach Frank Vandewiele has been notified of your message.